Over fall break, 10 William Jewell College students and two staff members made their way to Houston, Texas to help with Hurricane Harvey relief. The group left Jewell Wednesday Oct. 11 at 3 p.m. and returned at midnight Sunday Oct. 15. The ten students were Jonathan Morris, senior psychology major; Rylan Schuster, senior accounting major; Aaron Brake, senior biology major; James Hobbs, first-year history and English major; Mason Bake, junior nonprofit leadership and business administration major; Tana Pottorf, senior biology major; Seki Anderson, senior biochemistry major; Hannah Keeney, sophomore chemistry major; Melissa Ward, sophomore pre-nursing and psychology major; and Zandie Mehlhaff, sophomore nursing and Applied Critical Thought and Inquiry major. They were accompanied by Jeff Buscher, College Chaplain, and Daniel Ramirez, Assistant Director of International Admission and Transfer Recruitment. Buscher organized the trip and connected with contacts in Houston. “Over the course of three years, we took about five trips including Katrina. So when Harvey hit Houston, it was not long after school started and since we had fall break coming up in five weeks, I kind of put [forward] that possibility and I didn’t want it to be just my idea. So I put out a list to see who is interested in going and I started working finding a location, a place to stay, finding all the logistics work to do. The idea really came from disaster trips that came from the past. We did Katrina, we worked on cutting tree limbs after an ice storm in Springfield, we went to Florida one time after some hurricanes. We have a history of trying to respond to natural disaster when it is feasible at Jewell,” he said. The group partnered with Butch Green, a cooperative Baptist fellowship missionary in that area, who works primarily with immigration and human trafficking issues. Green is currently working with disaster relief and is helping groups coming into Houston. He works with several different agencies to find projects and connect groups with residents who need help. The Jewell group stayed at Temple Baptist Church, which supplied them with air mattresses, snacks, toiletries and shower trailers. Students who participated were fueled by the desire to help those in need. “One of my future career goals as a person in the medical field is to use my knowledge gained from schooling and experience to be able to get up and leave if a natural disaster or man-made catastrophe arises. Although this hurricane relief trip was not medicine based, I had two hands that worked and a caring heart. I had no reason not to go and help,” said Pottorf. 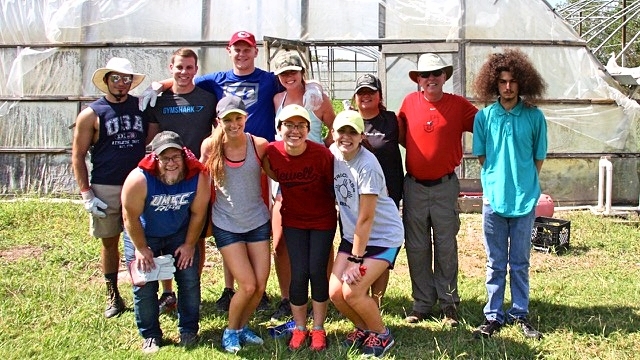 The group worked with a Cambodian community that relies on growing water spinach for a living. 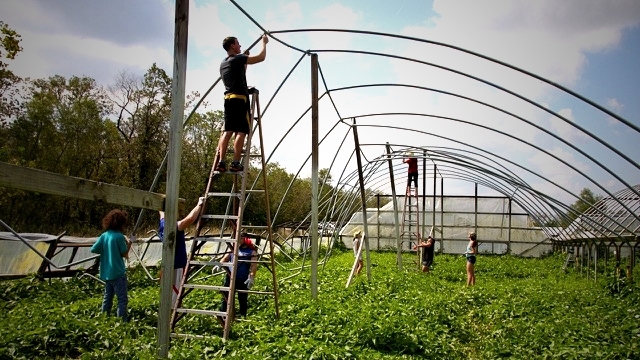 The group cleaned the steel poles of the destroyed greenhouse so that the community could rebuild a new one. The volunteers also partnered with the Fifth Ward Community Redevelopment Corporation to clear damaged items from houses. The group then organized and managed donations for Home Depot that would help residents rebuild and restore their furniture. Later, they helped individuals empty their houses and tear up ruined wooden floors. The houses required full gutting. The group also removed kitchen cabinets and tile walls from bathrooms. Students had an overall positive experience and were proud of the contributions they made to the communities affected by Hurricane Harvey. “My personal favorite part of the trip was talking with the families we helped during and after the projects. The stories they told were very eye-opening and impacted me to want to help in as many ways as I can in the future with people in similar situations,” said Morris. “This trip has affected me as a person by showing me that people of natural disasters are optimistic and thankful. The storm took a lot of their material things away from them, but they cared more about the people. As long as family members and friends were safe, the material things did not matter as much. This is a very good message for everyone who takes life for granted. It’s not about what we have, but it’s about the people we have that matter,” said Ward. Buscher gave advice to students who want to help out but are not sure where to start. A previous version of this article was published with inaccuracies.